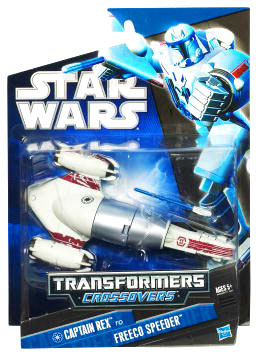 Description Of Item: SW Transformers Crossovers Black and Blue - Captain Rex to Freeco Bike. This warrior figure is twice the trouble for the enemies that try to take him on! In mech mode, your Captain Rex figure has the battle armor to fight any foe. When it?s time to chase down his fleeing opponents, convert him to Freeco Speeder vehicle mode to race after them in hot pursuit and launch his projectile accessory!